CEREC crowns are so popular today! 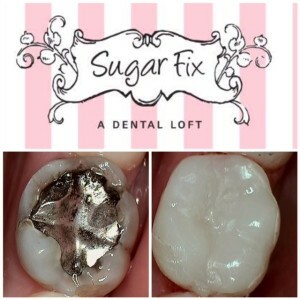 At Sugar Fix Dental Loft, we know first hand that dentistry develops cutting edge innovations and developments often. A recent development in dentistry is the CEREC (Chairside Economical Restoration of Esthetic Ceramics) technology, which has been growing more popular in Chicago! Today we’re taking a brief look at the reasons behind many patients looking for and talking about CEREC crowns. CEREC Crowns, before and after treatment. For starters (and important to our patients), CEREC crowns cut down treatment time and visits in comparison to regular crowns. With CEREC there is no need to wait for weeks for your made-to-order crowns! Dr. Emery and her team at Sugar Fix can offer you the CEREC crown and place it on your first visit. Therefore, you have the advantage of a super-fast treatment option without any of the waiting or follow up appointments. Without multiple visits, we’re able to save you money and time. CEREC Crowns are durable, as a result they last as long as traditional crowns. CEREC requires only one appointment! Our process makes it possible for you to have your permanent crown in one appointment. By the same token, lab-created crowns take a few weeks to complete, depending on the waiting period for the lab to complete your case. CEREC Crowns are made of ceramic. Did we mention ceramic is strong and looks phenomenal? If you do require a full gold or porcelain-fused-to-metal crown (PFM), for this reason we may recommend a lab-created restoration to give you the best results. CEREC Crowns are esthetic. CEREC same-day crowns look natural and are affordable.